FACT CHECK: Was It Illegal to Profit from Healthcare Prior to the HMO Act of 1973? Was It Illegal to Profit from Healthcare Prior to the HMO Act of 1973? While there are myriad arguments to be made that the legislation contributed to expansion of for-profit insurance companies, the HMO Act of 1973 is misrepresented in memes. Before the 1973 HMO act was signed into law by Richard Nixon, it was illegal to profit from healthcare. Did you know that before 1973 it was illegal in the US to profit off health care? The Health Maintenance Organization Act of 1973 passed by Nixon changed everything. In 1973, Nixon did a personal favor for his friend and campaign financier, Edgar Kaiser, then president and chairman of Kaiser-Permanente. Nixon signed into law, the Health Maintenance Organization Act of 1973, in which medical insurance agencies, hospitals, clinics and even doctors, could begin functioning as for-profit business entities instead of the service organizations they were intended to be. And which insurance company got the first taste of federal subsidies to implement HMOA73 *gasp* … why, it was Kaiser-Permanente! This text conflates two separate issues: the development of Health Maintenance Organizations (HMOs) in conjunction with alleged cozy ties between Kaiser-Permanente and the Nixon Administration, and the legal permissibility of for-profit healthcare. 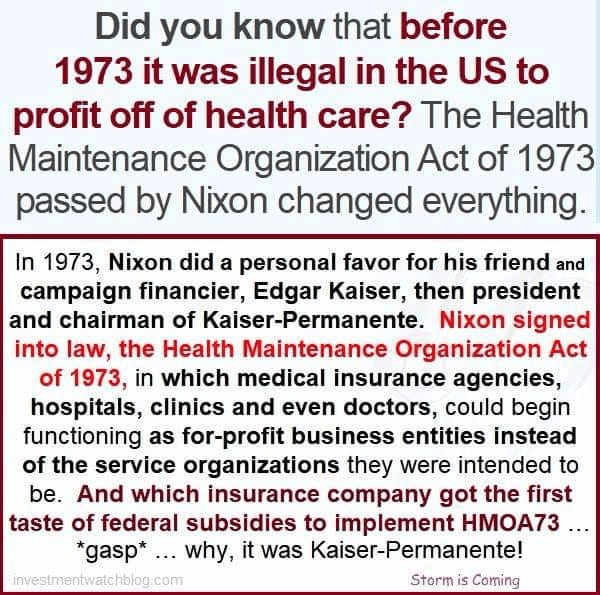 However, as for-profit health care existed prior to 1973, the Health Maintenance Organization Act clearly did not create or enable that phenomenon. For-profit insurance companies moved in, unencumbered by the Blues’ charitable mission. They accepted only younger, healthier patients on whom they could make a profit. They charged different rates, depending on factors like age, as they had long done with life insurance. And they produced different types of policies, for different amounts of money, which provided different levels of protection. In 1994, after state directors rebelled, the Blues’ board relented and allowed member plans to become for-profit insurers. Their primary motivation was not to charge patients more, but to gain access to the stock market to raise some quick cash to erase deficits. This was the final nail in the coffin of old-fashioned noble-minded health insurance. It is inaccurate to say that “before 1973 it was illegal in the US to profit off of health care,” as Aetna and Cigna had been profiting from health care for over 20 years before that. In traditional managed care plans (e.g., Health Maintenance Organizations) the money follows the “member,” whether ill or not. Although there are many definitions of managed care, generally the term describes a continuum of arrangements that integrate the financing and delivery of health care. Purchasers contract with (or “own”) selected providers to deliver a defined set of services at an agreed per-capita or per-service price. Richard Nixon was concerned about health care costs. Federal spending for the Medicare and Medicaid programs had surpassed everyone’s expectations. Their cost grew from 4.1 percent of the federal budget in 1961 to 11.3 percent by 1973. HMOs seemed to have everything Nixon needed … They appealed to Nixon and Republican conservatives became they were a free market approach, and they preserved the private insurance market. Moreover, they did not require large government spending as in the case of liberal, Democratic reform proposals. With support from a broad coalition in Congress, President Nixon secured the passage of the HMO Act of 1973. The Act enabled individual HMOs to receive endorsement (referred to as qualification) from the federal government, and it required employers to offer coverage from at least one federally qualified HMO to all employees (dual choice). However, the dual choice requirement was never enforced, and many large HMOs, including Kaiser, never sought federal qualification. The Act did facilitate growth in HMO enrollment by helping to create several successful HMOs around the country, and it legitimized the HMO concept. Paradoxically, the efforts to control expenditures for health services also stimulated corporate development. The conservative appropriation of liberal reform in the early seventies opened up HMOs as a field for business investment. 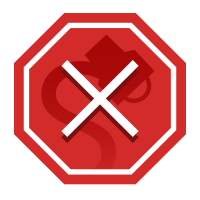 And in ways entirely unexpected, the regulation of hospitals and other efforts to contain costs set off a wave of acquisitions, mergers, and diversification in the nonprofit as well as profit-making sectors of the medical care industry. Pressure for efficient, business-like management of health care has also contributed to the collapse of the barriers that traditionally prevented corporate control of health services. In this light, it is fair to say that Richard Nixon’s support for HMOs presaged a dramatic transition in the American healthcare system that increased for-profit health insurance enterprises, but it is not fair to say that the act itself first made for-profit health insurance legal. Ironically, when Nixon signed the HMO Act in 1973 it had been so diluted by the political process from Ellwood’s ideas that Kaiser Permanente, a central model at the outset, did not qualify as an HMO until the act was amended four years later. “If more of our resources were invested in preventing sickness and accidents,” Nixon said, “fewer would have to be spent on costly cures. If we gave more attention to treating illness in its early stages, then we would be less troubled by acute disease. In short, we should build a true ‘health’ system—and not a ‘sickness’ system alone. All told, little factual basis supports the meme’s assertion that Nixon altered the legality of for-profit insurance by signing the HMO Act of 1973, or its claims that the act was a secret method for Nixon and his cronies to enrich themselves. The only sliver of truth here is the fact that the increase in popularity of HMOs that occurred after passage of the act (and its amendments) greatly expanded for-profit health care in America. Altman, Stuart and David Shactman. Power, Politics, and Universal Health Care: The Inside Story of a Century-Long Battle. Prometheus Books, 2011. ISBN 1616144564. RAND Graduate School Dissertation. 7 August 2003. Starr, Paul. The Social Transformation of American Medicine. Basic Books, 2017 (2nd edition). ISBN 0465093027.